India Post Payment Bank ( IPPB ) : Technology Revolution for Rural India & Social Reform for their existence of Government of India & Bonded labour system for Gramin Dak Sevaks. 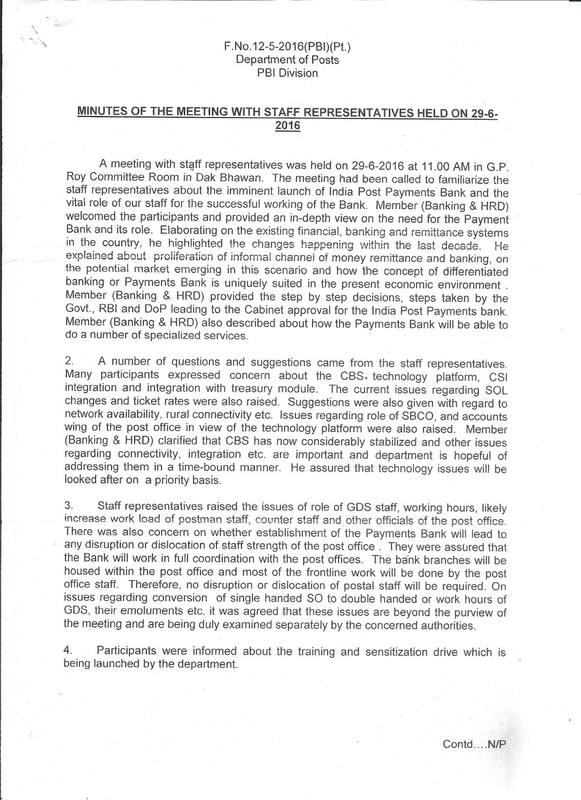 As per minutes of the meeting with staff representatives held on 29.06.2016, staff representatives raised the issues regarding role of GDS staff & working hours and it was agreed by the officers of IPPB , that these issues particularly removal of cap on working hours are beyond the purview of the meeting and are being duly examined separately by the concerned authorities. In Nov’2017 DoP asked comments & views from all Federations and Unions on IPPB. 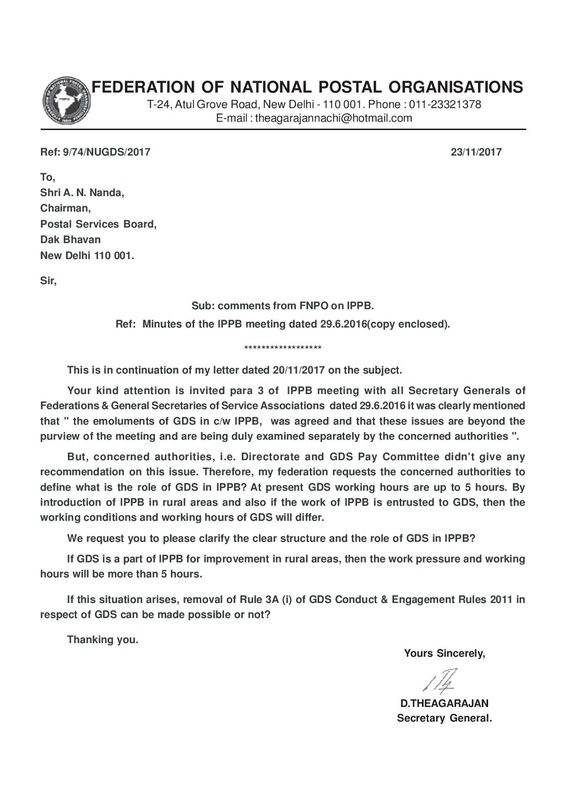 On 23.11.2017 FNPO wrote a letter to Secretary on the role of GDS exclusively in IPPB. If GDS is a part of IPPB for improvement in rural areas , then the work pressure and working hours will be more than 5 hours. If this situation arises , removal of Rule 3A(i) of GDS Conduct & Engagement Rules,2011 in respect of GDS can be made possible or not ? On 7.3.2018 one workshop was conducted by DoP with the representatives of service unions on sensitization of IPPB. FNPO is welcoming the IPPB proposal with a condition for not privatising /corporatizing DoP in future. And it is the responsibility of DOP for any financial loss cause of IPPB. We also demand for immediate remedy of staff shortage in all cadre. Regarding GDS FNPO is totally opposing incentive system proposal in IPPB and demanded for the work should be taken into account for calculation of GDS work load and cap on working hours should be removed. According to GDS pay report every BO is having 886 live accounts and many of the BPMs are working for more than 10 hours. AP circle RTI information and relevant evidences also submitted. IPPB is going to tie up with 11 ministries from which 52 welfare services are distributed to public. After inauguration of IPPB each and every GDS irrespective of the cadre has to work for more than 10 hours. 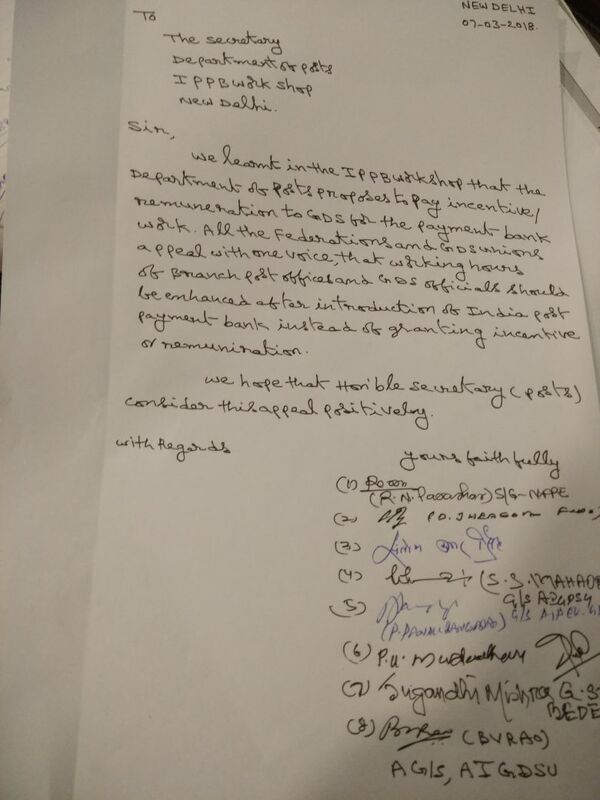 In view of these FNPO demanded for removal of CAP on working hours i.e; 5 hours( Rule 3 A(i) ). In the above said workshop all Federations & Unions refused incentive to GDS staff and raise their voice towards removal of Rule 3A(i) of GDS Conduct& Engagement Rules,2011 and a memorandum submitted to Secretary , Posts. 1. The earlier nomenclature of GDS (Conduct &Service) Rules ,1964 may be restored to enable the GDS to enjoy civil servant status. Accordingly the present GDS rules may be modified. 2. The existing Rule 3A (1) may be modified to enable the Sevaks to get pay and allowances as per work load following the law laid down by the Supreme Court i.e. Equal pay for equal work. 3. To implement the recommendations of GDS Committee report. 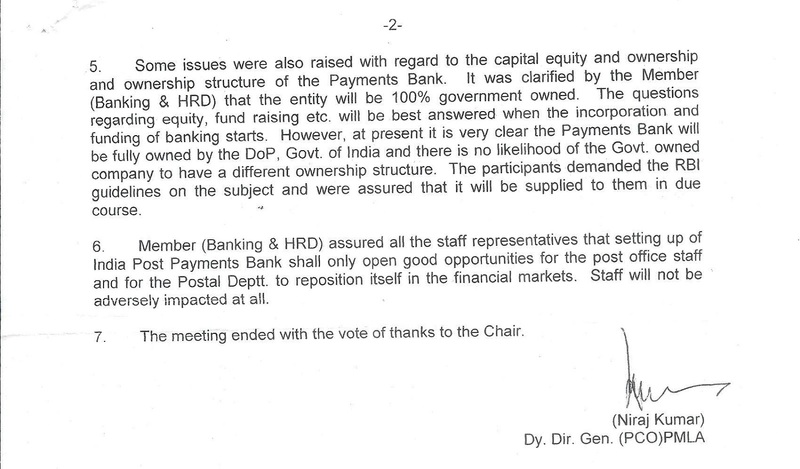 But till date DoP has not turned up with any positive reply to the above said letters and memorandums but simply announced a incentive structure to GDS for IPPB work. The factor of Rs.1,000 /Rs.2,000 incentive per month will not compensate for the work being done above the regular duties of GDS working hours. 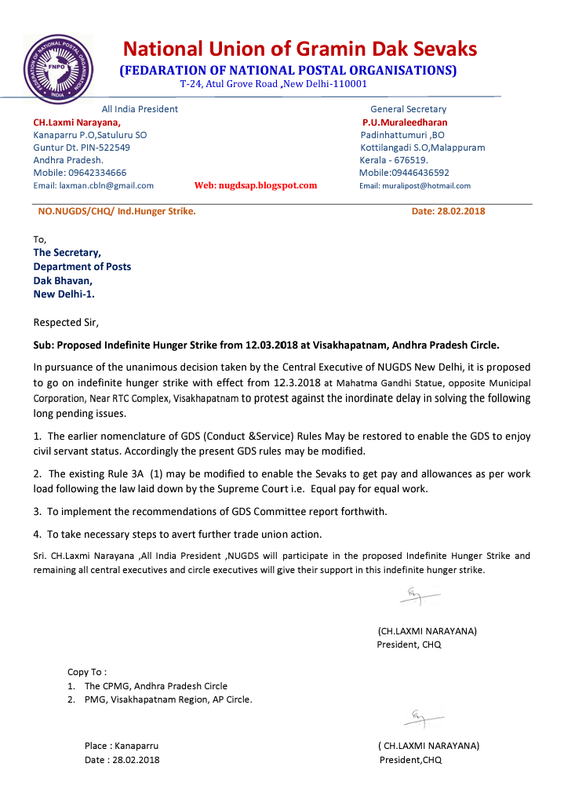 So, all Federations and Unions should take a remarkable step for removing the cap i.e 5 hours on working hours of GDS by abolished the GDS Conduct&Engagement Rules,2011 and restoration of ED (Conduct & Service ) Rules,1964 which are statuatory, legal and constitutionally valid.